Some people may not be well acquainted with the brand Radley, but the cute little dog logo is admired by thousands. The brand are renowned for creating beautiful, quality leather handbags and purses, but recently their accessories line has hit the limelight. Admittedly, I was one of those people that associated Radley with older women, however I'm in love with their new 2013 collections. Radley have grasped exactly what this season is about with their bright colours and attention to detail. Since the preview of the Spring/Summer collection, lots of fashion bloggers have jumped onto the Radley bandwagon showcasing their love through a series of reviews and picture postings. The new Radley bags are clearly highly sought after, but it's their watches that have really grabbed my attention. When I started writing my blog, if you approached me and said: "Radley would be giving you a watch to review", I would have laughed my head off and presumed you were highly intoxicated. When in fact Radley did offer me a watch to review, I started jumping up and down like a child at Christmas. The watch arrived last week in an elegant silver box with gold writing on top. The pillow supporting the watch was soft and the embellishments around the clock face shone as I opened the lid. The thing element to really catch my attention was the tiny dog attached to the strap. It very much reminds me of a Scottish Terrier, which has to be among one of my top dog breeds. Being vegetarian, I make my love of animals known to everyone and when I first worse this watch, I knew it completely matched my personality. Unfortunately when I received the watch, it was far too big for me and needed to be re-sized This was no fault of the watch, just mine for having quite slim wrists. I literally took the watch to the jewelers the same day it arrived, because I was itching to wear it on my night out. The watch feels wonderful to wear. It is very light, delicate and you barely know it's there. The chain is only very small, so it looks very elegant and would easily adapt from day wear to nightwear. 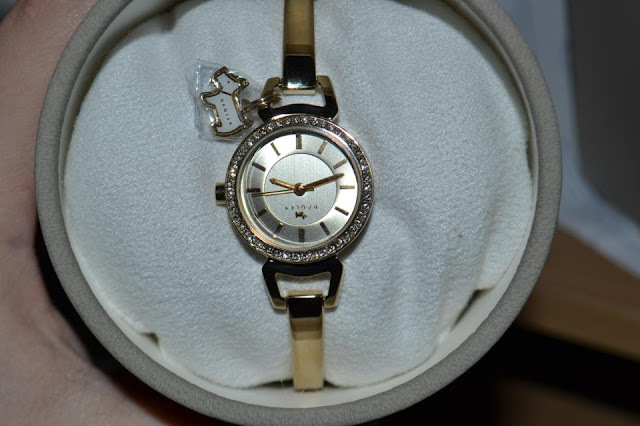 The stone set clock face looks really pretty and adds a gentle sparkle to the watch, without going too over the top. I find the clock face relatively easy to read and yet again, I'm loving the little Radley logo in the centre again. The price of this watch is £119 which is reasonable for something of such high quality. I'm so glad Radley brought my attention to their line of watches, because I never even knew they made them. These beautifully crafted watches prove that Radley is such a versatile brand and there's a lot more to them than just their handbags. Check out their beautiful watches here! Its great to see a Radley watch reviewed. We love to see the little doggie tag on this watch. Its a great feature. Fans love this on the Radley watches. Great review.